Oh, hello. I didn’t see you come in. 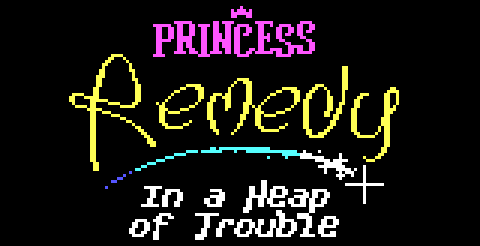 We were just working on this game called Princess Remedy In a Heap of Trouble, which is a prequel to our game jam game Princess Remedy In a World of Hurt. This new game is similar in scope to the first one, but with some changes and additions. An enormous Boss Tower has sprung from the ground, lifting entire towns up with it. People got used to it and kept living on the tower, but they’re starting to contract all sorts of mysterious illnesses. Princess Remedy, still in Saturnian healing school, must use her powers to heal everyone and defeat the Boss Tower. Like the previous game, there are several worlds and a total of 64 NPCs, the majority of which need to be healed by engaging in one-screen battle scenes. There is also a boss at the end of each world. Remedy can speak to anyone who is healed and ask them on a date, which replaces her Flask bomb in the Healing Mode battles with a range of other abilities, depending on who she’s dating. As usual, there are many silly characters to meet and secret chests to find. As the scope is so small, the game will also be quite cheap. Now, if you’ll excuse me, I have to break a swan’s neck.